Nothing startling with the above headline apart from the next line which read: ‘Archaeologists found the artefact in a remote part of Dartmoor…‘. Now things become interesting, this find was the result of a student field exercise carried out by City College Plymouth and lead by Win Scutt and Ross Dean. They and their team were carrying out a survey of the ruined medieval settlement on the slopes of Gutter Tor as part of the University’s Foundation Degree in Archaeological Practice course. On the last day of the survey the team discovered a 2 metre-long slab of granite lying close to the ruins of the medieval settlement and initially deemed it to be a gatepost. However, further examination revealed some incisions and the fact that the stone had three arms and a long incised channel down the length of the shaft. It was also noted that the cross was: ‘probably unfinished‘ but considering the state of some Dartmoor crosses is not surprising. The article states that the team have dated the ancient cross to the 13th century although it does not reveal on what evidence this is based. There can be no doubt that there are the remains of a deserted site that according to English Heritage was possibly known as Gutter Tor which consisted of five buildings and associated enclosures. The first mention of the place-name ‘Gutter Tor’ can be found in the assize rolls of 1281 where it was listed as Gotetorre and by 1539 this had mutated to Goats’ Tor. The Place Name Society suggest that the first element of the name stems from the Old English word Cnæpp, (Gover et al. 1992, p.240), meaning top or summit, (Clark Hall, 2004, p.71), thus giving top/summit tor. It is thought that this settlement was one of a dozen such sites located around the vicinity of the river Plym. It appears that by the post medieval period all the settlements had been abandoned, possibly due to climate and/or soil deterioration, following which came the establishment of the rabbit warren of Ditsworthy. So, the survey evidence of the English Heritage field investigations along with the Plymouth team concur that the buildings are of a medieval date which on the surface would give some credence to the cross dating to the same period as suggested by Scutt. Following the old adage that ‘seeing is believing’ this find warranted a visit and at first light on a bitterly cold morning I wandered out to Gutter Tor. The ruins of the settlement are located on the lower south-eastern slopes of the tor just above the Ditsworthy road, sadly I have no GPS grid reference because I forgot my glasses and couldn’t read the display, what’s new. Luckily the remains were easily identifiable and with the help of the photograph from the Plymouth paper so was the ‘cross’. As always every new discovery brings up some questions. 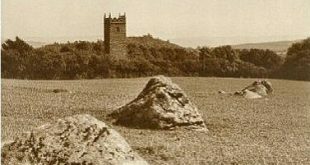 In 1977 and 2005 Gutter Tor was visited by an English Heritage Field Investigator who noted the medieval ruins and despite the fact that the ‘cross’ is located within feet of one of the buildings, no mention was made of its existence? Why would a medieval cross have a, ‘long incised channel’ running down the centre of the shaft? there is no other example of such on Dartmoor. When completed, what was the cross intended for? all major trans-moor routes lie to the north and west of Gutter Tor and are marked with ancient crosses. Granted, there may have been an original intent to fashion a preaching cross for the settlement. Is the ‘cross’ in its original position or had it been moved there to serve another use? How far into the peat does the granite slab go? the answer to this would determine its actual size. Why is there no mention by the Dartmoor writers such as Worth, Crossing, Breton, Hemery etc? It would be very interesting to see the written results of the survey to establish by what means and evidence is given for the actual classification and date. But as mentioned above, nobody is ever right and nobody is ever wrong when it comes to the past – we weren’t there so we don’t know. It would be fantastic if this granite slab was a long lost cross as it’s always nice to discover parts of Dartmoor’s lost heritage. Clark Hall, J. R. 2004. A Concise Anglo-Saxon Dictionary, London: University of Toronto Press.